This beat is pretty open-ended, as you can use the vocal sample in different twists. You can love someone, and “never mind what they (others) say, never mind what they do), or you can do you, and “never mind what they say, never mind what they do,” etc. In the “hook” section, there’s a small vocal part that sounds like “About Me,” which can work for you. It can work in different ways, and if you want the beat, we can also strip that part if requested. Otherwise, it’s pretty open-ended, and you can use your imagination and creativity. In an attempt to get my music out there to different listeners, I decided that I would try hitting up the college radio stations that might be willing to give me airplay. After my first experience with Real Heat Radio, I figured that I would send my music out to different types of listeners to get a better idea of what audience would like my music. This information was taken from their website at http://wnyu.org/your-music. For MP3 submissions, you can e-mail Jacqueline Castel at maketheproduct@wnyu.org or go to the (Make The) Product MySpace for more details. I’ve submitted three songs in via MP3, and hopefully I can get some airplay! I’ll keep you guys posted. Here’s another kit from the Urban Fire series, which is most of the same style as 4, but there are some extra things in here that make it unique. There’s a Middle Eastern folder with some ethnic perc sounds, amongst other things. The Machina-Ren folder is pretty interesting as well, as it’s a shoutout to the popular SR-16 Drum Machine by Alesis. The Lazy Claps folder also has some interesting clap sounds that may fit certain styles. The title track of BBI’s upcoming album has been released, “The Lyricist Manifesto!” You can check for it and other news on the BBI on the Black and Blue Ink. Blog. 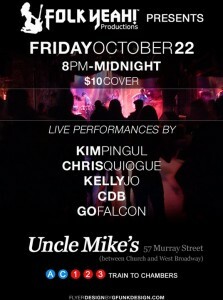 Watch Kim Pingul Perform at Uncle Mike’s in New York City, October 22, 2010! 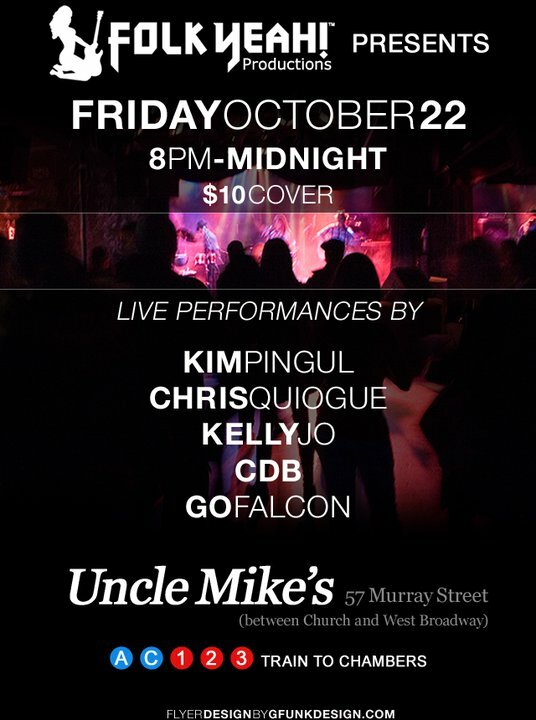 Kim Pingul will be performing at Uncle Mike’s on 57 Murray Street in New York City on October 22, 2010! If you’re a fan of acoustic music, make sure you check it out! 5FaM affiliate Chris Quiogue will also be performing as well. Here’s a song that Kim Pingul and I worked a few months ago. It’s a Kim Pingul composition, and I helped produce it. You are currently browsing the The MooN sHizzLe Productions Blog – MsP News Updates and tips on Music Production, Mixing, Recording, Marketing, Music Software Error Fixes, and Music Theory and Application blog archives for October, 2010.